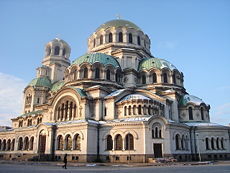 Alexander Nevsky Cathedral, Sofia, by Alexander Pomerantsev. The Byzantine Revival or Neo-Byzantine movement was an architectural revival movement most frequently seen in religious, institutional and public buildings. It emerged in the 1840s in Western Europe and peaked in the last quarter of 19th century in the Russian Empire; an isolated Neo-Byzantine school was active in Yugoslavia between World War I and World War II. Neo-Byzantine architecture incorporates elements of the Byzantine style associated with Eastern and Orthodox Christian architecture dating from the 5th through 11th centuries, notably that of Constantinople and the Exarchate of Ravenna. The style is characterized by round arches, vaults and domes, brick and stucco surfaces, symbolic ornamentation, and the use of decorative mosaics. Earliest example of emerging Byzantine-Romanesque architecture was the Abbey of Saint Boniface, laid down by Ludwig I of Bavaria in 1835 and completed in 1840. The basilica followed the rules of 6th century Ravenna architecture, although its corinthian order was a clear deviation from the historical Byzantine art. In 1876 Ludwig II of Bavaria commissioned Neo-Byzantine interiors of the Neuschwanstein Castle, complete with mosaic images of Justinian I and Greek saints. Danish architect Theophil Hansen became a supporter of the style in the 1850s. His major works belonged to Neo-Grec style, however, Hansen as a professor of Byzantine art in University of Vienna shaped a generation of architects that popularized Neo-Byzantine architecture in Austro-Hungary, Serbia and post-war Yugoslavia. Hansen's own Neo-Byzantine work include the Greek Church of Trinity (1856—1858) in Vienna and Chistuskirche in Matzleindorf (1858—1860). The Sophia Cathedral in Pushkin (1782—1788) was the earliest and isolated experiment with Byzantine treatment of otherwise neoclassical structures. In 1830s Nicholas I of Russia promoted the so-called Russo-Byzantine style of churches designed by Konstantin Thon. Nicholas I despised true Byzantine art; Thon's style in fact had little common with it. Notably, Thon routinely replaced the circular Byzantine arch with a keel-shaped gable, and the hemispherical Byzantine dome with an onion dome; layout and structural scheme of his churches clearly belonged to neoclassical standard. True Byzantine art, popularized by Grigory Gagarin and David Grimm, was adopted by Alexander II of Russia as the de-facto official style of the Orthodox Church. Byzantine architecture became a vehicle of Orthodox expansion on the frontiers of Empire (Congress Poland, Crimea, the Caucasus). However, few buildings were completed in Alexander II reign due to financial troubles. Alexander III changed state preference in favor of Russian Revival trend based on 16th-17th century Moscow and Yaroslavl tradition, yet Byzantine architecture remained a common choice, especially for large cathedrals. Neo-Byzantine cathedrals concentrated in the western provinces (Poland, Lithuania), the Army bases in Caucasus and Central Asia, the Cossack hosts and the industrial region in Urals around the city of Perm. Architects David Grimm and Vasily Kosyakov developed a unique national type of a single-dome Byzantine cathedral with four symmetrical pendetive apses that became de-facto standard in 1880s-1890s. The reign of Nicholas II was notable for the architects's turn from this standard back to Hagia Sophia legacy, peaking in the Naval Cathedral in Kronstadt and Poti cathedral. These designs employed reinforced concrete that allowed very fast construction schedule; their interiors contained clear references to contemporary Art Nouveau yet the exteriors were a clear homage to medieval Constantinople. Russian Neo-Byzantine tradition was terminated by the revolution of 1917 but was continued by emigrant architects in Yugoslavia and Harbin. New Athos Monastery in Abkhazia. Interior of St. Vladimir's Cathedral in Kiev. Novodevichy Cemetery church (1908-15) in St. Petersburg. The Saint Vladimir Cathedral in Chersonesus, 19th century, commemorating the presumed place of St. Vladimir's baptism, (1850 - ). Church of Dmitry Solunsky in Saint Petersburg (1861–1866) by Roman Kuzmin. In 1888 Vasily Kosyakov found the ultimate proportion of a single-dome design. Blueprints of his Astrakhan church were copied in Kamianets-Podilskyi, Ukraine, before the original was completed (1895–1904). Annunciation Cathedral, Kharkov, Ukraine, 1888–1901. Christ the Savior Cathedral in Borki (Kharkiv Oblast, Ukraine), ca. 1900; this was the inspiration for the St. Sophia Cathedral in Harbin. In the United States and elsewhere, the Neo-Byzantine style is often seen in vernacular amalgamations with other Medieval revivalist styles such as Romanesque and Gothic, or even with the Mission Revival or Spanish Colonial Revival styles. Notable American examples include many buildings on the campus of Rice University in Texas, St. Francis de Sales Church in Philadelphia, Cathedral Basilica of St. Louis and the Basilica of the National Shrine of the Immaculate Conception built between 1920 and 1959 in Washington, D.C. In the early 1980s, famed American architect Philip Johnson designed a Post-Modernist addition to the Cleveland Play House that reflects Byzantine influences, and could thus be termed Neo-Byzantine. St. Sophia Cathedral (Los Angeles, California), 1952. St. Francis de Sales Roman Catholic Church, Philadelphia (1907). From about 1850 to 1880 in the English city of Bristol a related style known as Bristol Byzantine was popular for industrial buildings which combined elements of the Byzantine style with Moorish architecture. In South London there is Christ Church, North Brixton by Beresford Pite, 1897-1903. Just a few metres from the Oval Cricket Ground. Neo-Byzantine architecture in the Russian Empire at Wikipedia. The Neo-Byzantine façade of Westminster Cathedral, London. Temple of Holy Trinity and St. Spiridio, Trieste. The Neo-Byzantine cathedral at Poti, Georgia, 1906–7. Alexander Nevsky Cathedral, Tiflis, Georgia, 1871-72 and 1889-97. St. Michael the Archangel Church in Kaunas, Lithuania, was built in Roman-Byzantine style. The church of the Theotokos Orans in Vilnius (1899–1903) demonstrates typical features of developed Byzantine revival: exposed two-tone, striped, masonry; four symmetrical apses tightly fused into the main dome; arcades blending into the domes; and a relatively small belltower. Church of the Holy Wisdom of God, Harbin, China, 1907, 1923-32. Annunciation of the Theotokos (Blagovescekaya Church), Harbin, China, 1930-41. Destroyed in 1970. Temple of Saint Sava, Belgrade (1935-41, 1985-present), by Aleksandar Deroko. Metropolitan Church of St Nicholas - Volos, Greece. Designed by renowned Greek architect Aristotelis Zachos (1871-1939). Romano-Byzantine style Cathedral de la Major (1852-93) in Marseilles. Painting of the Neuschwanstein Castle Throne Room. Anthony Cutler. The Tyranny of Hagia Sophia: Notes on Greek Orthodox Church Design in the United States. Journal of the Society of Architectural Historians. Vol. 31, No. 1 (Mar., 1972), pp. 38-50. Slobodan Ćurčić. The Role of Late Byzantine Thessalonike in Church Architecture in the Balkans. Dumbarton Oaks Papers. Vol. 57, Symposium on Late Byzantine Thessalonike (2003), pp. 65-84 (+photos). This page was last edited on June 4, 2012, at 00:23. This page has been accessed 42,955 times.